The City of Philadelphia has announced more information on Thursday's Eagles' Super Bowl parade. Millions of fans are expected to come out and celebrate the city's first Super Bowl win and first NFL championship in 58 years. The parade will start at 11 a.m. at Broad & Pattison in South Philadelphia and head north towards City Hall. 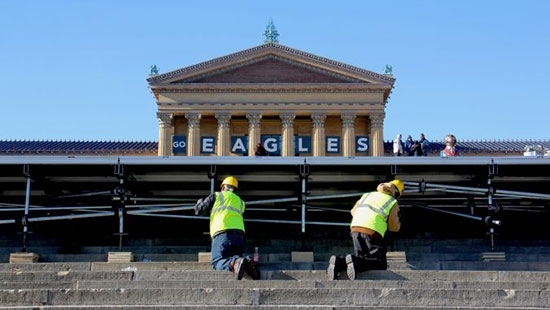 The parade will then zip zag out to the Benjamin Franklin Parkway and end at the Philadelphia Art Museum. Ceremonies at the Art Museum will start at 1 p.m. and end at 3 p.m. There will be 14 jumbotrons placed along the route. The weather for Thursday is expected to be sunny with high of 35. Text "ReadyEagles" to 888-777 to receive free alerts from the City about public safety, transit, and everything parade related.